The now world famous powerboat, as driven up the Thames by David Beckham to bring the Olympic flame to the stadium for the London 2012 Olympics opening ceremony was a Bladerunner BR RIB35. 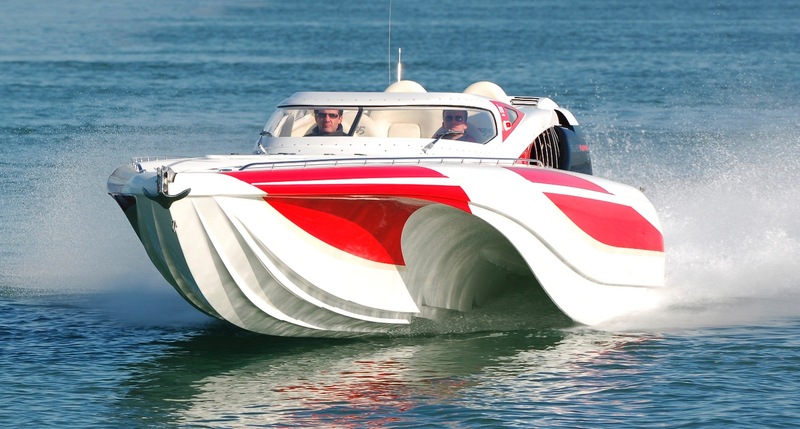 This unique British fibreglass powerboat was designed and manufactured by ICE Marine Ltd., fabricated using Scott Bader Crystic products. The craft’s heritage and racing design pedigree comes from Lorne Campbell, ICE Marine’s chief naval architect and the 1995 two litre powerboat world champion and managing director, Jeremy Watts, who was the Bladerunner driver during the torch handover part of the opening ceremony event. Depending on the Bladerunner model and specification required by a customer, laminate constructions use a combination of chopped strand matting, biaxial and unidirectional glass and carbon fibre fabrics, as well as mainly using DIAB’s Divinycell H80 and H100 PVC foam cores; sandwich laminate sections are used extensively in the structural design of both the hull and deck. Reliable product performance on the water in line with the demanding design specifications of a Bladerunner BR RIB 35 powerboat is critical; fitted with either a 300hp or 350hp supercharged Mercury Verado outboard petrol engine, speeds of up to 72-77 knots (82-88mph) can be achieved, putting enormous pressure on the hull at top speed. To achieve the highest long term mechanical performance of the laminate sandwich structures in key stress areas, PVC foam cores are first primed using a light coating of catalysed Crystic 489PA resin and then bonded in with Crystic Crestomer 1196PA, a low density gap filling structural adhesive specially designed for core bonding; vacuum bagging is used by ICE Marine, as recommended by Scott Bader, to ensure void free adhesion and to maximise the penetration of the gap filling structural adhesive around the PVC core material. The superior core bonding performance of Crestomer 1196PA has been well proven for many years by many other leading fibreglass boatbuilders, who also value the added benefit of improved hull and deck surface finish by reducing print through by using Crestomer 1196PA for core bonding. The Bladerunner series is founded on the desire to build a highly efficient offshore performance focused powerboat, which is able to offer people who enjoy travelling by boat significantly improved ride comfort and handling in open water at speed. This has been achieved by ICE Marine with their highly innovative ‘double scoop’ air entrapment monohull (AEM) design, used for all Bladerunner powerboats. This AEM monohull design is unique to ICE Marine. It was co-developed by Jeremy Watts and Lorne Campbell who has thirty years’ experience as a naval architect designing class-winning high performance powerboats and trimarans; Campbell’s designs have an enviable 100 race wins and 20 World and National championships to his credit.